The outer oily or lipid layer that prevents the tears from breaking up and evaporating, and also helps the tears spread over the cornea. This layer is produced by the meibomian glands, about 25 of which line the margins of each eyelid. The oils secreted by these glands should be clear and run freely, resembling olive oil. Sometimes, however, the glands become blocked and/or the secretions become hard and waxy, no longer flowing freely. The middle aqueous layer that makes up the bulk of the tears. 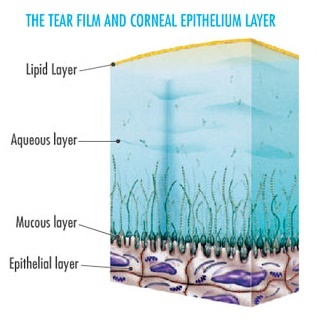 This layer is produced mainly by the lacrimal glands along with a number of smaller glands in the conjunctiva; it also contains various salts, proteins and anti-bodies that are critical for corneal wound repair and resistance against infection. The inner mucous layer that is responsible for enabling the tears to wet the eye by adhering to its front surface. This layer also removes unwanted fatty compounds from the corneal surface. There are two main forms of dry eye disease - these are typically called evaporative dry eye, caused poor quality tears, and aqueous insufficiency due to low tear quantity. Evaporative dry eye accounts for around 80% of dry eye disease and is caused by poor functioning and/or blockage of the meibomian glands, also known as meibomian gland dysfunction (MGD - see also below). Decreased oil secretion by the meibomian glands results in rapid evaporation and breakup of the tears. Aqueous insufficiency occurs when the lacrimal gland fails to produce enough of the watery component of the tears. This results in hyperosmolarity of the tears, which means the tear salts and proteins become highly concentrated. In turn these high concentrations irritate the front surface of the eye, causing it to become inflamed. Aside from meibomian gland dysfunction, other conditions that are often associated with dry eye disease include anterior blepharitis and Sjögren's syndrome. Some systemic medication and general health conditions have also been associated with dry eye disease. Meibomian gland dysfunction (MGD) describes chronic abnormality of the meibomian glands. it can occur if the glands become blocked, if the oily secretions become thickened, or if there is low production of oils by the glands. It is important to note that if blocked meibomian glands are left untreated they eventually cease to function and "drop out" - once this stage has been reached the glands can not recover or ever produce oils again. Anterior blepharitis refers to inflammation of the outside edge of the eyelids, most commonly caused by staph bacteria infection or by dandruff of the scalp and eyebrows. Anterior blepharitis frequently leads to secondary infection of the meibomian glands that sit more posteriorly (towards the back edge of the eyelids). Sjögren's syndrome is a disease where the body's immune system attacks its own moisture-producing glands, including the lacrimal glands. It most commonly co-exists with rheumatoid arthritis, systemic lupus, systemic sclerosis (scleroderma) and polymyositis/dermatomyositis. Because the lacrimal glands are affected by this condition, aqueous insufficient dry eye disease results. Our diagnostic tests and methods for diagnosing and classifying dry eye are outlined here.